CPO Md. 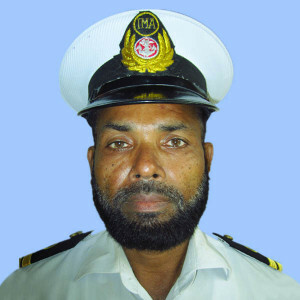 Noor Hossain PATWARY (Retd) served in Bangladesh Navy for 28 years. During his service he served in various naval Ships. He was appointed as Seamanship Instructions and he also performed the duties of OOD, Lowering/hoisting of Boats, Anchoring, Weighing, Mooring, Berthing Ship, Casting off Ships, Coming along side, Handling of Ships less than 20 meters, Conducting PT, Parade, Drills. After retirement he served as admin officer and Fire Safety Compliance officer in Textile Sector. At present he is employed as Seamanship and Survival Instructor of the Academy for last 3 years.